The recently built 3 star Sun Palace with its 2 star wing is situated in the centre of the resort, close to the lively market area and main promenade. 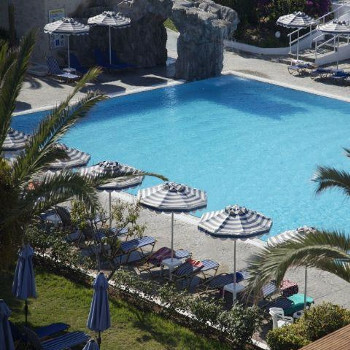 The hotel offers comfortable accommodation, a fine range of leisure facilities and easy access to the beach. We stayed in the sun palace hotel sunny beach the cleanliness was superb rooms cleaned every day the food was disgusting however having been here twice before I didn't expect much. Food was served at 6 in the evening and at 3.30 they would be putting it out ready! The staff some friendly well just the 1 i can recall, other than not been able to get round the pool either it is a nice hotel good location! first the hotel is very nice clean and in a good spot. stayed at hotel sun palace last 2 weeks of june ai basis the hotel staff were very friendly especialy the girls who cleaned our room every day they work very hard for little pay and always have a smile and a goodmorning for you.the first 2 days the food was good then it went right down hill they must have a veal factory outside because for the other 12 days they had fried veal, veal goulash and veal in tomato sauce and chicken livers.theres a kiddies section with chicken nuggets,chips and mash which was like water,i hope i never see another chicken nugget again lol.for breakfast you can have pancakes,fried eggs and bacon from the outside bar area which was fine,there is also a selection of ham and cheeses,only at breakfast fine on toast.i wouldnt come back to this hotel only for the simple reason that the food was rubbish.the evening entertainment is geared up for kids even although the broachure says there is adult entertainment theres none. the hotel was in an excellent location with regards to the surrounding area and main strip . our room was ready for us on arrival the room was spacious very clean and had a large balcony over looking the pool which i quite liked as that is the side the sun rises in the morning . the staff were friendly and the hotel was always clean . the bathroom in our room was large but got very wet when you had a shower as it was all tiled put a towel down as i managed to slip up and fall over . the food was some what bland and repetitive but then again you are in another country and should expect local cuisine they had chips and chicken nuggets for the kiddies and salad . its cheap enough to eat out if you don't like the hotel food so its no problem there was little or no sweet options so when you get that sugar pang you just have to go buy something . the drinks for all inclusive customers were fine a little strong for my liking 3 quarters of a pint glass of vodka and a splash of coke was a little much for me but i think they pour it till you ask them to stop which is no big deal . they offer cocktails at the main inside bar and beer all day . i do remember a fellow Brit constantly complaining that the bar didn't open till 11 am but who wants a vodka and coke with breakfast ? the pool was nice there was a children's pool which looked really safe and in good position to watch the kiddies from the pool side there was absolutely no glasses allowed around the pool side for obvious reasons but plastic glasses were provided so it was safe for children to run about . there was an endless amount of bars to go to along the beach and karaoke bars everywhere which i loved . my biggest complaint about the holiday would be the person i took with me i recommend you choose your company well . other than that the hotel was a brilliant place to stay in and not only would i recommend it but i am returning to the same hotel again this year . i recommend June and July for the best weather in Bulgaria . also buy your sun tan lotion before you go as its very expensive there. i hope you enjoy your holiday in sunny beach . We stayed at the Sun Palace during the last two weeks of September 2007. We stayed in the '4 star' part of the hotel (more like 3 star) and found the rooms to be spacious, with plenty of cupboard space, a TV and very clean. The Bathroom was very basic, although a hair dryer was provided. There was only one small all inclusive bar tucked at the back of the hotel resturant. No problems obtaining beer, spirits and soft drinks although there was no diet/sugar free options available. None of the above was available until after 11.00 am. The staff worked very hard at all hours keeping all the communial areas clean and tidy. There was plenty of room around the pool area, no problems in getting a sun bed. Both pools though were very cold. Our main complaint along with the majority of people in the hotel was with quality and variety of the food. It was always cold and seemed to be made up of left overs from the previous day. Definitely not to the english palette, even the most adventurous amongst us struggled to find anything to their liking. The coffee tasted like luke warm mud and I would advise you to take your own tea bags and coffee (and a travel kettle if you want a drink in your room when you get up). Overall we booked two weeks too late as things in the resort were starting to close and the weather could get quite nippy im the evening, so would advise you to take jeans and a jumper. We would not visit this hotel again due to the standard of the food,which is a real shame as it could be a great hotel if they sorted this problem out. We booked for the 4* accomodation. The room was spacious and adequate. The food was poor. Everyone we spoke to had the same opinion. The food was cold at all times and there was no variety. We would certainly go back to Bulgaria but would definitely go to a different hotel. the room was spacious but needed redecorating, carpet was grubby.hotel staff were unsmiling and sometimes rude. the food was eactly the same every day, everything was stew. only hot food was the soup, and it was the same 2 soups for the 2 weeks. the entertainment consisted of 3 girls aged 15/16/17 who did their best but the description implied there was more for the children to do. the childrens playgound consisted of a small slide and swing which anyone over 6 was too big for. some things advertised just were not there. my husband and daughter both had ear infections and were not alone, the doctor on site though was vey good. there was building work next to the pool which we had not been informed of, and the music started blaring out poolside from 9.30am until the early hours.